In Zeltros, there were two weapon gamblers that met under ironic conditions: as rivals. Kale Okoth and Liah Kast worked in the same business, but they were enemies. Once, at a skirmish between local gangs and the Zeltros Police, where both gamblers almost got involved, they finally took the time to meet each other without aiming their guns, and they fell in love rather quickly. Because of the gang issue, they had to move to another place, and they chose the planet Corellia. They moved to the center of the city of Tyrena, in Corellia, and some time later a boy named Ruluk would have been born in 275.08 ABY. His parents could raise him themselves for half of the time, and the other half was either spent on a good school or with the Zabrak babysitter Vresa Jast. Ruluk could study two years in that school. His parents had to travel various times, and then Ruluk would stay with his friendly and beautiful babysitter. When his parents were with him, they usually played with Ruluk with some fake (deficient) weapons that they had stored. When the kid turned five, a Jedi Knight called Rash Loist arrived to Corellia for unknown business. He had to stay longer due to a very aggressive weather. The Knight stayed in a hotel close to Ruluk’s house, and by coincidence, during a moment when he was out, he noticed that a kid intuitively knew how to go past some robbers without harm. The kid, however, got surrounded, so the Jedi went to rescue him. The Jedi noticed that such boy had a connection with the force, so he talked to him and followed the little Zeltron to his house. After a small discussion between the Jedi and the parents of the boy, they accepted to let Ruluk be taken to a Jedi Academy, recognizing that it would be the best for their child. They told Ruluk to remember them and visit them once he was already a Jedi Knight. By this time, Ruluk was 5 and half years old. Ruluk began his training in 280.31 ABY, and his life focused mainly on his advance through the Jedi Order. He was a well-disciplined student most of the time, but he possessed his slight lack of manners, a persistent behavior, and his love to a group of little boys led by him, which he named “The Smally Army”, based on a few war holofilms that he had watched during previous years. Only a few times he decided to choose another path than the one taught by the masters. 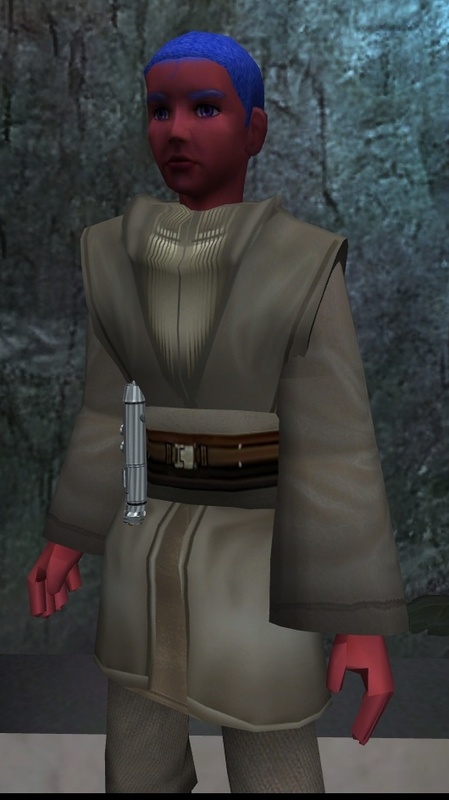 At his 10th birthday (285.08 ABY), he was taken as Padawan to the Twi’lek Jedi Knight Fane Ornn’ila, who was well-known inside the academy and would be like his new mother. He also kept protecting his Smally Army, which was getting a bad fame thanks to a personal issue he had with fellow Padawan, an Iktotchi named Serris K’ral, and fellow Initiate, a female Zeltron named Alara Meta.